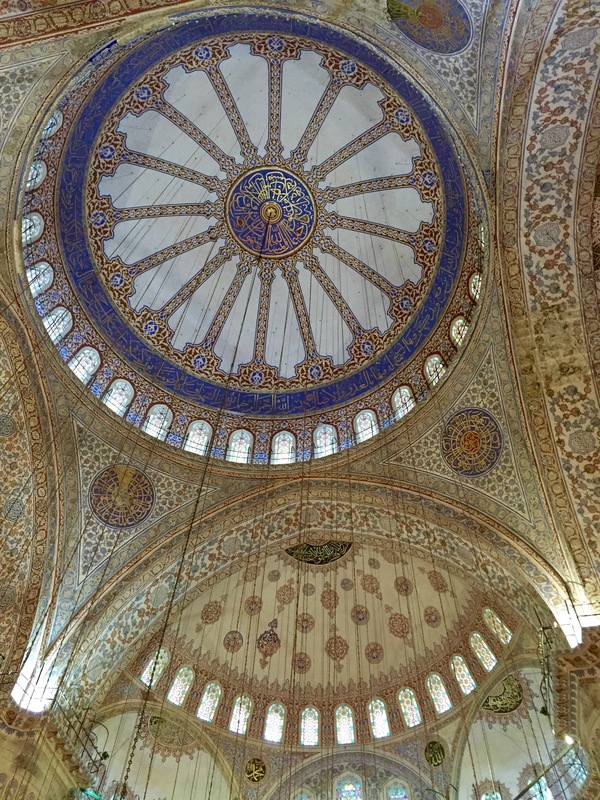 The past few sites I’ve highlighted in my slowly trickling out recap of my trip to Istanbul have been museums (Hagia Sophia, Topkapi Palace, Basilica Cisterns) which cost between 25-30TL (less than $10) to enter, are well worth the price. However, what’s even better than cheap? That would be free. 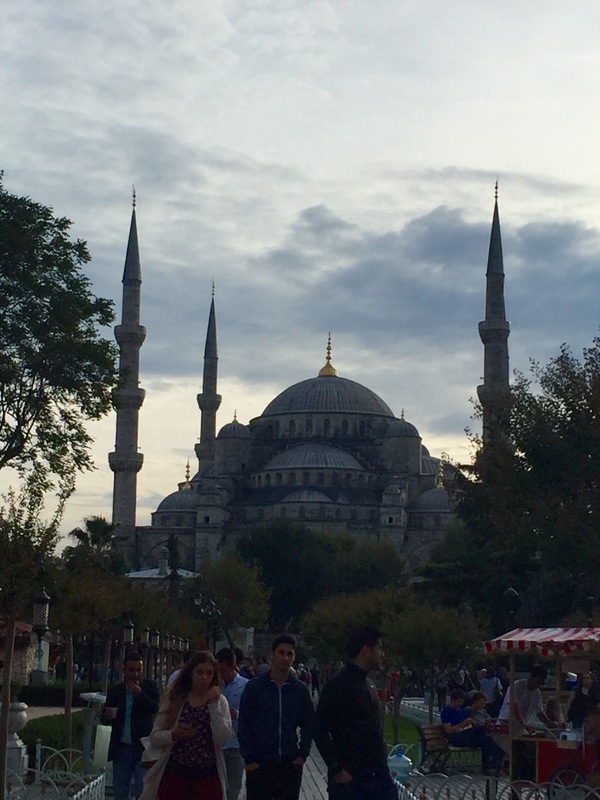 The Sultan Ahmet Mosque, also know as the Blue Mosque, is located just across the way from all three sites I’ve mentioned previously. It is another UNESCO World Heritage Site, and its exterior is perhaps the most iconic image of Istanbul. The cherry on top of this beautiful cake is that entry is entirely free. Make sure that you stop by. The reason it is free, is that unlike the Hagia Sophia, Topkapi Palace, and Basilica Cistern, the Sultanahmet is not a museum, it is a real, functioning mosque, that is open to worshippers, and visitors of all kinds, all day every day. Muslims pray five times a day, and the mosque does close to tourists briefly at these intervals, but the prayers typically last less than a half hour, and otherwise the mosque is open from roughly 9 to 5. These prayer times are signified by the athan, or Muslim call to prayer from the minaret of the mosque. If you hear it, know that the mosque will be closing for prayers at that time. The five prayers take place at dawn, early afternoon, late afternoon, sunset, and before bed, so a safe bet would be to visit the mosque in the morning. Because it is a place of worship, appropriate dress is a must. Men should wear long pants, and women should wear long sleeves, pants or a a skirt coming to their ankles, and a scarf over their head. It’s honestly pretty easy to make sure you’re dressed appropriately. Because the Sultan Ahmet is used to thousands and thousands of visitors, they’re not going to be massively strict about whether your hairline is poking out from under your scarf, but it is important to be respectful and comply with the dress requirements. I wore jeans and a loose t-shirt with a light summer scarf around my neck for the day, and when we went into the mosque threw my jean jacket on and pulled the scarf over my head. Personally, I always feel much more comfortable being prepared and appropriate for local customs whenever I travel abroad, but if you forget or don’t want to carry a scarf with you, there are attendants at the entrance of the mosque who can provide one for you to wear while inside. Both women and men will also be required to take your shoes off before entering the mosque, and they will provide plastic bags for you to hold them in. Entrance to the mosque is free, but they do have a donation box, and it is a nice gesture to throw a few lira into it. The money is used to maintain the mosque and keep it open to visitors. Me, my sister, and my mom at the Hagia Sophia. To go into the Sultan Ahmet we just slipped on our scarfs and jackets. With all of the logistics out of the way (I like to deal with that first because being the stereotypical culturally insensitive, blundering American tourist stresses me out), it’s time to enjoy the mosque. The Sultan Ahmet is as spectacular from the outside as it is from the inside. If you approach the mosque from the central plaza, you’ll get to see it in all of its glory; it is truly spectacular. 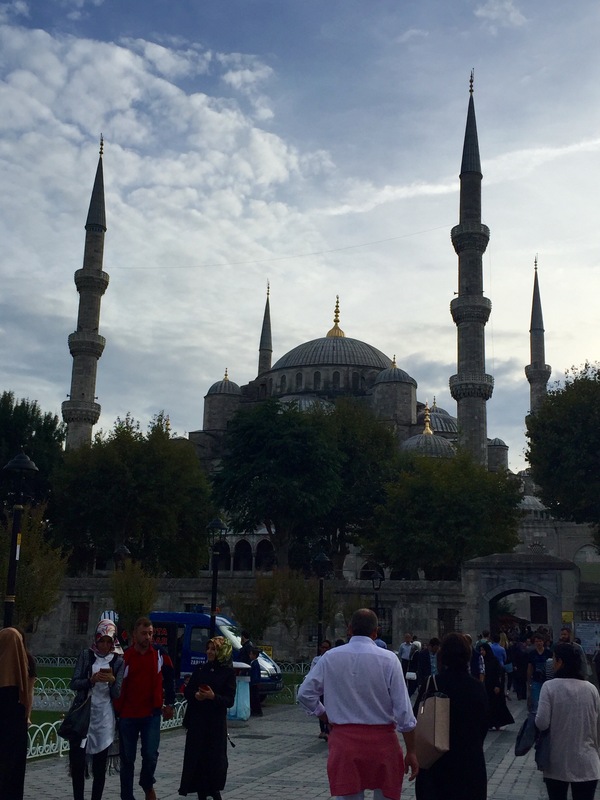 The mosque has five large domes, six minarets, and a number of smaller domes peeking over the Istanbul skyline, and its courtyard is lined with trees and gardens. 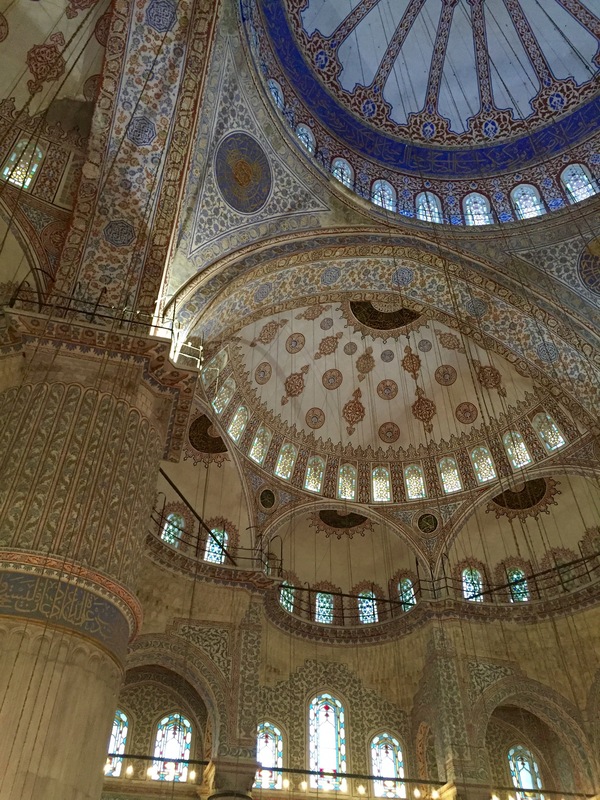 Inside the mosque, it becomes clear why the Sultan Ahmet is commonly referred to as the Blue Mosque. Its walls are covered with brilliant blue handmade tiles, cresting over the beautifully intricate painted domed ceilings inscribed with Qur’anic calligraphy and floral designs. Enormous low hanging chandeliers pool light on the carpets below where worshipers and visitors mill around marveling at the architecture. More light shines through the many stained glass windows- a nod to the Christian architectural influences of the mosque. The beauty of the interior of the Sultan Ahmet is simply breathtaking. I have uploaded a video I took circling around and around in place, I thought it better than trying to take a million photos of the interior (I sure took a million almost identical photos of the exterior, don’t worry).